The Camouflage series plates are part of a larger dinner setting to be included in our forthcoming exhibition of new work by Stephen Bowers showing November - December 2016. These Camouflage series plates are part of a projected, large, multi-piece table setting, which incorporate ideas of tromp-l’oeil, natural history, decorative arts, historical reference and oblique, personal commentary. Retaining something of their utilitarian value, they refer to consumption, use and display. With their fragments of image and sections of decoration, the plates suggest the possibilities of larger stories. 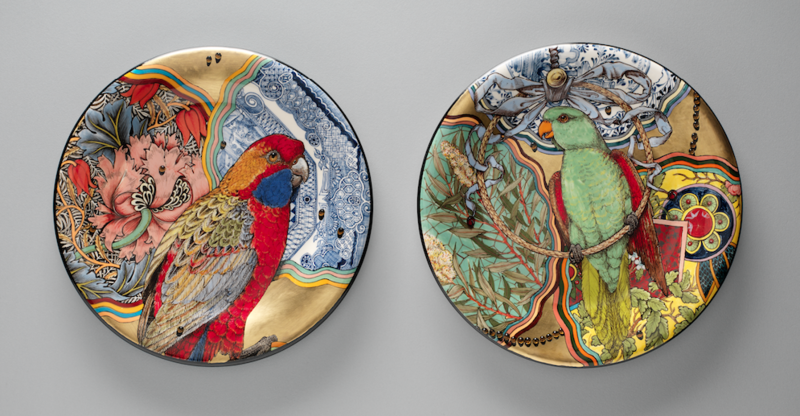 Featuring parrots and cockatoos against intricate backgrounds, these plates explore ideas of pattern-in-nature and nature-in-pattern. Segments of botanical designs, some derived from William Morris wallpaper or French Toile printed textiles, remind us of the colour, beauty and complexity of the natural world and its appropriation into man-made environments. These images of fragmentation are a response to the dilemma of living in a time when natural systems and environmental patterns are being disrupted by the ever more rapid consumption of finite resources, the pressure of human population and environmental impact, global warming and the breaking down of the resilience of the natural world.